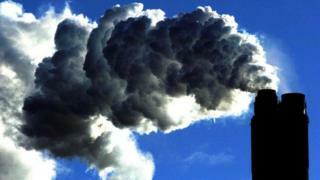 The UK government has set a world-leading climate change target up to the early 2030s. The Fifth Carbon Budget will cut carbon emissions by 57% by 2032 - that's based on 1990 levels. The announcement will help reassure investors needed to overhaul the UK's ageing energy system. But the government's advisory Committee on Climate Change (CCC) has warned the targets will be missed unless policies are improved. Labour's Barry Gardiner urged tougher policies, although he said: "At a time of great division and instability, I welcome the decision to set the Fifth Carbon Budget. "I recognise the difficulties that the Energy Secretary (Amber Rudd) has faced from many of her colleagues in securing this agreement, particularly in the aftermath of the vote to leave the EU." Environmentalists and the energy industry are also relieved that the Fifth Carbon Budget will be adopted, even though they say the targets need to be more demanding to meet the ambitions of the global Paris climate change accord to hold global temperature rise as close as possible to 1.5C. There have been doubts about government commitment on climate change after huge cuts in renewables subsidies followed by the vote to leave the EU, which influences so much of the UK's energy. But Ms Rudd said climate change remained one of the most serious long-term risks to the economy. Speaking at the Business & Climate Summit in London, she said: "Climate change has not been downgraded as a threat. "We must not turn our back on Europe or the world … So while I think the UK's role in dealing with a warming planet may have been made harder by the decision last Thursday, our commitment to dealing with it has not gone away." Business spokesmen at the conference echoed a call by the former Labour Climate Secretary Ed Miliband for the Prime Minister to ratify the Paris climate accord immediately. The CCC's latest report today calculates that the UK's emissions cuts are in line so far with the goal of the Climate Change Act of cutting CO2 80% by 2050. But it says a new approach is needed to ensure emissions keep falling. It mentions housing as well as agriculture and transport - two sectors where emissions are already growing. There has, for instance, been a rise in purchases of larger cars since the Chancellor changed VED rules so a driver pays as much VED for a Prius as a Porsche. The committee also says ministers must support carbon capture and storage technology, which will allow fossil fuels to continue to be burned. The Prime Minister said this innovation was essential for the UK - before he withdrew the funds supporting it. Professor Dave Reay from the University of Edinburgh, said of the CCC report: "This wake-up call for climate policy will inevitably be drowned out by Brexit furore this week. That's a crying shame as the message here is clear: we must do better. From agriculture to transport, from energy efficiency to carbon capture, UK action on climate change is faltering." But Marylyn Haines-Evans from the National Federation of Women's Institutes said the confirmation of the Carbon Budget was good news: "This is important both for future generations, and also for the British wildlife and countryside that our members care so much about." The climate sceptic group Global Warming Policy Forum (GWPF) complained the decision should have been left to the next government. A statement said: "The government has behaved unreasonably, and should have delayed approval of the Budget and reassessed the impacts in the light of the far-reaching changes flowing from the referendum result." Simon Bullock from Friends of the Earth said: "After the huge confusion following the Brexit vote, we welcome the certainty this decision gives. Investors will now know that the UK is a place where low carbon investment can flourish. The big challenge is to ensure stronger policies to meet this carbon budget." Environment groups were celebrating the further delay on a Heathrow runway decision following Brexit uncertainty. They are also hoping that the Brexit vote provokes French unions into rejecting Hinkley nuclear station. Labour says the government left it so late to notify Parliament about the Carbon Budget that it is technically in breach of the Climate Change Act. This mandates that carbon budgets must be passed by both houses of Parliament by the end of June, which is now impossible. Ministers insist, though, that the Budget will become law.